< Previous Video : Scribble Flowers at Scrapbook Boutique! Next > Video : Celebrate Diamond Die Cutting! Such a cute “amazing” card, Therese! Love the colouring, layout, and that “Amazing” die in gold!! This is so sweet! I love when you color with your Prisma Pencils!!! Every single inch of this card is amazing beyond that gorgeous sentiment! 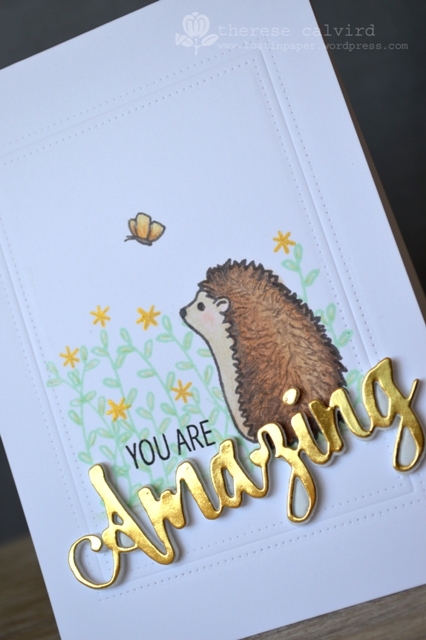 Love your adorable card–that little hedgehog is so sweet! And the gold sentiment really looks stunning! Gorgeous. 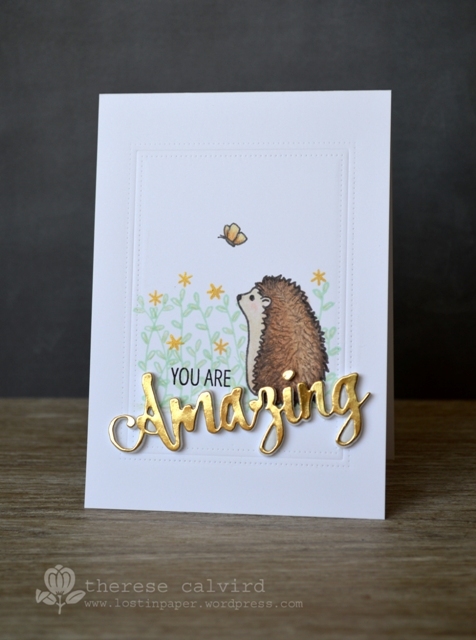 Love the gold sentiment die and that hedgehog is just adorable. And as always beautifully done. This is the perfect way to frame out such a cute scene, Therese! Love those tiny yellow blooms and butterfly in the background, and your gold sentiment is fabulous! I know I say this all the time, but it’s true…You are SO CLEVER!!! what an adorable card.. love the gold sentiment. 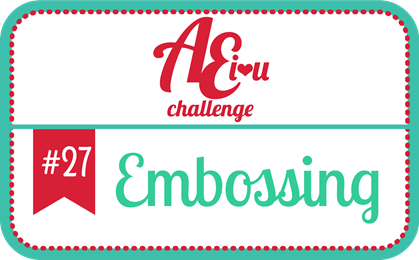 Love the double emboss rectangles. Never thought of doing that…now I must go and try! As always…love your card! Always love gold! Gorgeous card and sounds like you enjoyed your AE shopping. Woohoo! Such a gorgeous card and oh so sweet! I love that gold and the inlaid design of the stitched frame. I just received this set from my brother and CANNOT wait to play with it! Thanks for the inspiration! Have a great week! Love all of it, the cute critter, the framing of the cute critter and the brilliant die cut, mmmmm might need this one too. Oh I LOVE the rich gold touch! Amazing and sweet card, indeed! Love this cutie hedgehog image! Gorgeous colouring on that adorable hedgehog and I love the embossed frame! I love hedgehogs and this one is such a little sweetie!! I really like all the dies with the sewing type details to them (would buy them all if I could). Its amazing how such a subtle detail can add so much to a card, just like it did with yours. Beautiful! Beautiful how that adorable image is framed! Love also how the gold “pops” I think it gives the card just that extra ‘body’ it needs. Great job!! Dont know how I missed this one, maybe on one of my visits to mum and dad and no internet. Congrats on your win, well deserved. Beautiful card. Love that die cut.